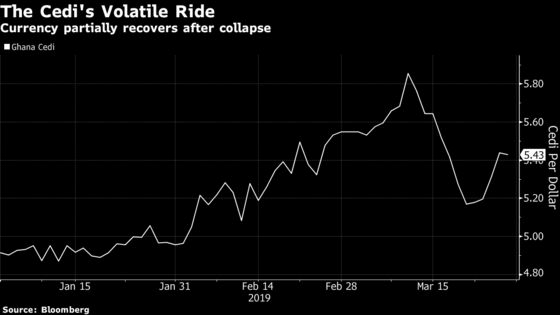 (Bloomberg) -- Ghanaian Finance Minister Ken Ofori-Atta said the government will investigate the reasons behind the recent collapse of the country’s currency. The cedi weakened as much as 16 percent this year, before recovering partially over the past two weeks. Most of the losses were incurred after the central bank unexpectedly cut its benchmark rate by 100 basis points to 16 percent in January and as some foreign holders of Ghana’s debt failed to rollover their holdings. President Nana Akufo-Addo “has directed that we investigate the structural causes of the depreciation of the cedi and to propose measures to address the situation,” Ofori-Atta told lawmakers Thursday in the capital, Accra. The review will be conducted by a committee led by Ofori-Atta and Bank of Ghana Governor Ernest Addison, he said. The currency gained 0.2 percent to 5.4128 cedi against the dollar at 1:20 p.m. on Thursday, paring this year’s losses to 9.2 percent. Ghana’s economic fundamentals are sound and should help to support the cedi, while the government will improve the transparency of foreign-exchange markets to minimize panic buying, said Ofori-Atta. Over the longer term, the government will develop Ghana’s capital markets to lower its reliance on foreign investors, he said. “Our current progress on the economy, sustained GDP growth and economic transformation will ensure our currency is resilient going forward,” said Ofori-Atta.